Take a look at my author website. Check out this TV interview with Bullseye Breach author, Greg Scott, with Keith Marler and Jason Matheson on The Buzz, Twin Cities KMSP TV, Fox Channel 9, May 26, 2015. And that was why an obsolete, barely functional computer, sitting on a cluttered desk in a tiny family business with no secrets inside its computer network anyone cared about, became a key link in a global chain of events that shook the world. Available at booksellers everywhere. Click here to order your copy. Bullseye Breach was a 2015 Midwest Book Awards finalist. Details here. 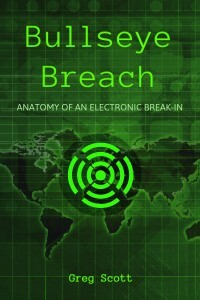 Bullseye Breach is an IT security educational book disguised as a fiction international thriller ripped from recent headlines about how a large Minneapolis retailer loses 40 million card numbers to an international cast of criminals. 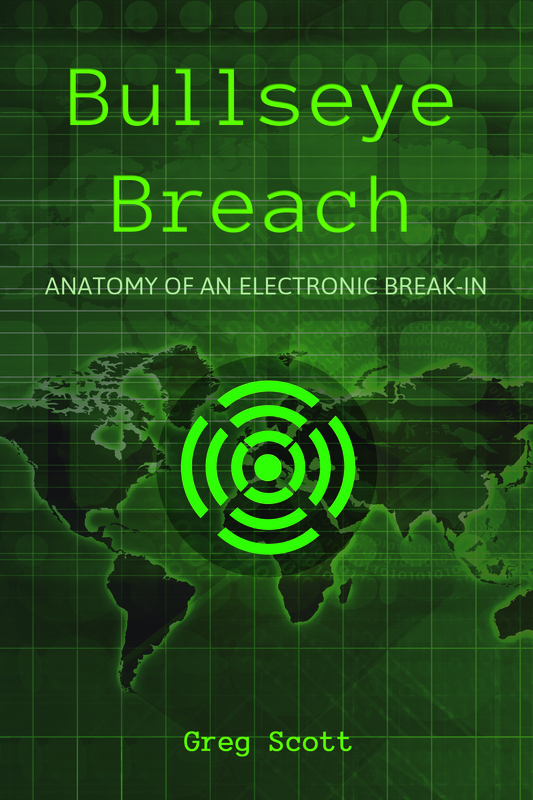 People are mystified by the sensational data breaches in the news recently. Bullseye Breach unravels that mystery. It’s a great story with all the international thriller elements, including a floating dead body in the Gulf of Finland. Follow how crooks scour the Internet to find their target, how they initially penetrate the Bullseye Stores’ network and recon the network looking for paydirt, and how they deploy malicious software to steal credit card numbers on a breathtaking scale. Along the way, you’ll also meet a few downstream criminals and innocent victims. And a few people in Minneapolis not bound by stifling corporate bureaucracy who come up with an ingenious way to fight back. The story would be unbelievable, except that similar events continue to really happen in real life. The sensational headlines are all around us. Bullseye Breach goes behind the sensational headlines and uses fiction as a vehicle to teach readers how the bad guys operate and how we can protect ourselves. I know you’ll enjoy reading it. Thanks to Beaver’s Pond Press for bridging the gap between self publishing and traditional publishing. Properly publishing a book is a team effort and Beaver’s Pond Press brought the right professionals to this project to make it the best it can be. Here is a link to the Beaver’s Pond Press website. And thanks to Laura Drew of Drew Design for a great cover. Here is the Drew Design website. You can also check out Bullseye Breach teasers on my Infrasupport company website, here. It would be a privilege to have a signed copy from the author! I’m proud of you Uncle! It would be a privilege to get you a copy, niece. Consider it done! Wow – happy upcoming birthday! Come celebrate it at Eagan Hills Church, 2pm Sunday April 19 in the 3rd floor upper room. Bring the family. I’m putting together some great content and we’ll have TopLine FCU talking about safe online banking. And Ken Steinhardt via Skype with some first-hand credit card stories. Thanks. I spent much of today working on eBooks. I have Kindle and epub formats almost ready to go. And preorders for both paper and eBooks from Amazon, BN, and others should be online in the next few days. The issue isn’t can a functional and economically attractive Cloud solution be built (typically they can! ), it’s can it be done in a manner where all parties that use it have confidence in the security of the information and the resources to provide availability and integrity for all information. That’s the Big Deal, and that’s what Bulleye Breach so cleverly shares through a Michael Crichton-like whirlwind story that is very hard to put down once you start. Part mystery, part suspense, part education, part technology, and all entertainment, Bullseye Breach is an extremely impressive first offering from author Greg Scott. You don’t need to be particularly well-versed in IT to enjoy it, but you will be wiser after you read it. The issue isn’t can a functional and economically attractive Cloud solution be built (typically they can! ), it’s can it be done in a manner where all parties that use it have confidence in the security of the information and the resources to provide availability and integrity for all information. That’s the Big Deal, and that’s what Bulleye Breach so cleverly shares through a Michael Crichton-like whirlwind story that is very hard to put down once you start. Part mystery, part suspense, part education, part technology, and all entertainment, Bullseye Breach is an extremely impressive first offering from author Greg Scott. You don’t need to be particularly well-versed in IT to enjoy it, but you will be wiser after you read it. After reading the book, I actually have a better idea of how a multi-vector compromise happens, and how the little signs that should have been caught were missed. In the end, I think that is the message you are trying to deliver. You hit the nail pretty squarely. A perfect foray into how things can go terribly wwrrroonnggg. A most ambitious look at the global security ramifications of the simplest error in judgement. How a single person, with little or no security awareness, triggers an escalating cascade of cyber-devastation on every continent. This is a perfect foray into how things can go terribly wwrrroonnggg... And all it took to get started was - One Thoughtless <Click>.